Concerns over mandatory drug testing did not prevent teachers from approving a new contract yesterday that gives them 4 percent raises in each of the next two school years. » Four percent raises in each of the next two school years that will bring the starting teacher salary to $43,157, up from $39,901. » An additional step increase that will give most teachers an extra 3 percent raise in the second semester. » Random and reasonable-suspicion testing for alcohol and drugs beginning in the 2008-09 school year. » A 25 percent supplementary pay raise each year for teachers who serve as band directors or drama coaches or in other programs. 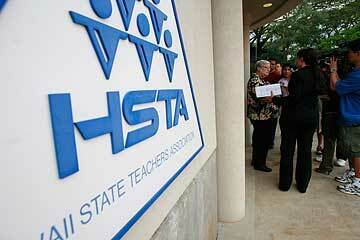 » A $3,000-a-year differential for licensed teachers working in Waianae, Nanakuli and Keaau, Big Island. The Hawaii State Teachers Association said 5,176 teachers (61.3 percent) voted for the contract, compared with 3,228 (38.2 percent) who opposed it. 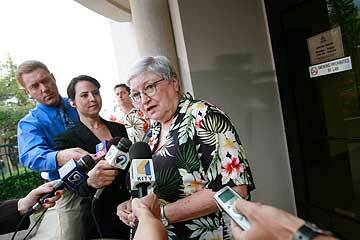 Ballots for 45 teachers, or 0.5 percent, were voided. Most of 13,404 eligible teachers cast their ballots at polls last week. But the results were too close to call, and the union had to tally 1,200 absentee ballots yesterday. Union officials attributed the split in votes to a controversial drug-testing clause in the contract. The last contract was backed by 93 percent of teachers two years ago. The new contract will pay an entry-level teacher with a bachelor's degree $43,157, up from $39,901, and increase the top teacher salary to $79,170 from $73,197. It also will require officials to start a reasonable-suspicion and random drug and alcohol testing program by June 30, 2008. A top union official is worried that Hawaii could have trouble hiring teachers under a new contract mandating random and reasonable-suspicion drug testing. "I think you are going to have a lot of very angry teachers," Joan Husted, executive director of the Hawaii State Teachers Association, said yesterday. "We believe it will have a chilling effect on recruiting." Island teachers will face drug testing starting in the 2008-09 school year under a new contract that gives them 4 percent raises in each of the next two school years. The deal will bring the pay of an entry-level teacher with a bachelor's degree to $43,157, up from $39,901, and increase the top teacher salary to $79,170 from $73,197. It also awards most teachers one step up in the pay scale in the second semester, giving them an additional 3 percent hike. The American Federation of Teachers, a national teachers union, ranks Hawaii 15th in the nation among average teacher pay. But critics say teachers here spend more money on everything from food to gas. Hawaii needs to hire about 3,400 teachers in the next two years, Husted said, noting that the state would be joining only a handful of other school districts that test teachers for drugs. "I didn't find too many teachers out there who were really thrilled with this whole idea," she said. Although he objects to drug tests, Randall Okimoto, a physical education teacher at Farrington High School, voted for the contract because of the extra money. He said he is concerned about how tests will be done, whether teachers taking medication will be protected from "false positive" results, and how much the tests could cost. The state could spend about $91,000 each year if the Department of Education tested between 15 percent and 20 percent of its workers, which is the norm for companies testing employees, according to Diagnostic Laboratory Services Inc.
"I feel like we could have used the money elsewhere," Okimoto said. Wallace Higa, a Roosevelt High School math teacher, voted against the contract because he felt it unfairly singled out teachers. But he has since changed his mind and now believes teachers should be held to a higher standard. "Today was a pleasant surprise," he said on the phone yesterday. "I'm glad it passed." The DOE, which already tests bus drivers, some physical therapists and auto mechanics instructors, will talk with the union to come up with a system, said spokesman Greg Knudsen. The Board of Education also will be involved, said member Denise Matsumoto, chairwoman of the board's committee on collective bargaining. The contract says "principals will not select teachers for random drug testing, nor will they or the DOE administer or read the results of the testing." Instead, an independent, certified laboratory would be hired to do the testing, it said. States with school districts that test teachers for drugs include Kentucky and Tennessee, according to attorney Follace Fields II, who in 2004 represented a Kentucky elementary school teacher challenging the Knott County schools' random drug-testing policy. In a lawsuit in federal court, Fields argued the testing violated Fourth Amendment protections against unreasonable searches and allowed schools to look at personal medical records protected under the Americans with Disabilities Act. The suit blocked the testing for some months, but a judge ultimately ruled in favor of the school, saying it was OK to test teachers to ensure a safe environment for children, Fields said. In Hawaii the issue of drug testing in schools has been highlighted by six drug-related arrests of DOE employees in the past eight months. Legislators even introduced a bill, now dead, that would have expanded drug testing to all public school employees who work close to children if there was reasonable suspicion they were intoxicated. Legislators have said the state will be able to fund the teacher contract, which would cost $119,380,888. Star-Bulletin reporter Robert Shikina contributed to this story.